I know lots of you would love to get an iPad, but can't afford one. So enter for a chance to win one! Also brought to you by this wonderful cohosts. Make sure to check them out. Giveaway runs from April 1 until April 30 and is open to US/Canada. Enter for a Chance to win an Ipad with Retina Display 64GB. You will also get a case for this great Ipad as well. The case will be your choice from Domeo Products. They are available online and also at Sam's Club. Check out my FULL review. I would keep it for me!! I would keep it for myself, but share it with my family. It'll be helpful to me as a college student! I will give this to my husband! I completely admit it would be for me!! BUT I have so many others here, I would share it with.. the kids! The iPad would be a gift for my boyfriend. I would keep it for myself since I don't have one and have been wanting one for quite some time. I would give it as a gift to my grandson. I would keep it for myself. Maybe share it with my son. the iPad would be a gift to me. I have been trying for quite some time to win an iPad, but to date have not been successful. I gave one to my husband already so this would be mine! It would be a gift to myself. It would also be used by my wife and grandkids. Great idea for a contest. Everybody I know who has an iPad loves it. I would keep it. Been wanting one for a long time! I would give this iPad to my son for either his birthday or Christmas. It would be for myself but the kids would take it over. I want to keep this for myself. I will give to my granddaughter. 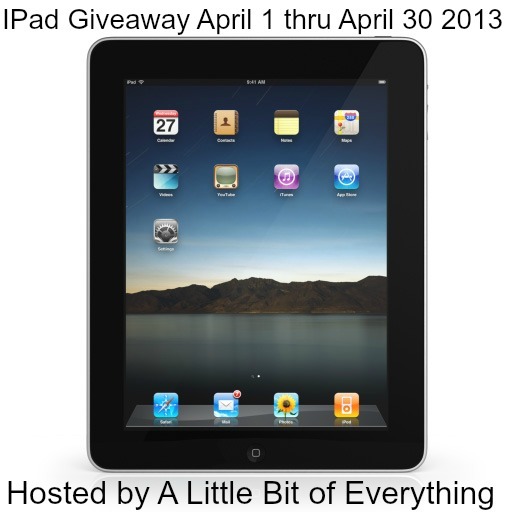 I would keep it for myself, but I enter a lot of iPad sweepstakes, so hopefully I can win some to give away too. I would keep the iPad for myself so I could finally be on the sane tech level as my sister. I would give it to my hubby. He's been eyeing it. I would give as a gift to my son who could use it while he is in paramedic training. I don't want to sound selfish, but...ME! I think I would keep it for my family! If I won the iPad it would be for myself and my immediate family to share. Thanks! I would give it to my son for his bday in a couple of weeks. He would be sooo excited!! I would keep it for myself. I have wanted one for so long. My mother really deserves an ipad! I know running giveaways are difficult. But time is short so I try 3 times and than quit! This giveaway won't even let me subscribe to it's newsletter. Unfortunate. I NEED an ipad so I'd keep it! I would give to my boyfriend for his birthday! I believe I would give it as a gift. I would keep it for myself and use it for craft show transactions! The Twitter follows for page 13 includes on follow that is not Twitter. I tell myself I would keep the Ipad if I won, but I would most likely give it to my daughter. A gift for the whole family!!! I'd keep it for my kids and especially for my son with PDD-NOS to play on - I've heard there are to be good apps out there for special needs kids like him! i would give it to my daughter as a graduation present. I think I would have to give it to my husband for Father's Day. I would love to say that I would give it away, but honestly I need something that can function as a computer for my homework when a conventional computer is not available for me to use. I would give it to my wife as a birthday present! She always gets me great stuff and she would love this! 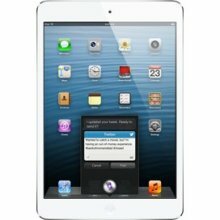 I would love to give the iPad to my mom who has wanted one for a long time but never gotten one. It would be a great gift for Mother's Day. I would keep it and use it all the time. I would keep it and use it with a smile! If I were fortunate to win this iPad I would (reluctantly - I've wanted an iPad for a long time) give it to my son who just moved into his own place.